Author: Borri, Joe Set In . . . Description: In the 60s and 70s, the northeast corner of Detroit was home to so many policemen or cops the area was nicknamed Copper Corner. The community was saturated with first generation-Americans of Italian descent. It's through this setting that the fictional stories within Eight Dogs Named Jack emerge. The stories are a mixture of pulp, noir, humor and drama, set against the backdrop of Detroit s East Side, their characters often roaming to northern Michigan and Canada. Up North, the street smarts the characters possess are tested against the mystical forces present in nature. The stories are crafted from the perspective of Joe Borri, the son of a Detroit cop, who married a girl whose father had a strong dislike for Detroit cops. His life in the two families inspired many of these yarns. 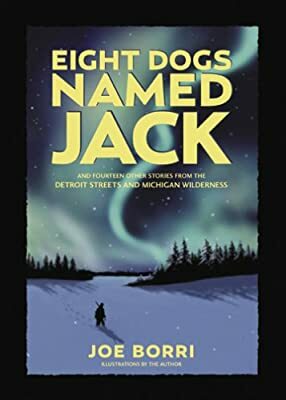 Eight Dogs Named Jack, and Fourteen Other Stories From the Detroit Streets and Michigan Wilderness, is an entertaining collection of tales where characters like Honest John, Tony the Hatchet, Sausages Burmanzini, Hopper, and other street gods call home.